← Guitar Month at DontCrack with Savings up-to 70% ! OldSkoolVerb Plus is the reverb that is ideal for guitars and percussive sounds. It is fantastic on all kinds of sounds but especially hard-attack sounds like drums and picked guitars. 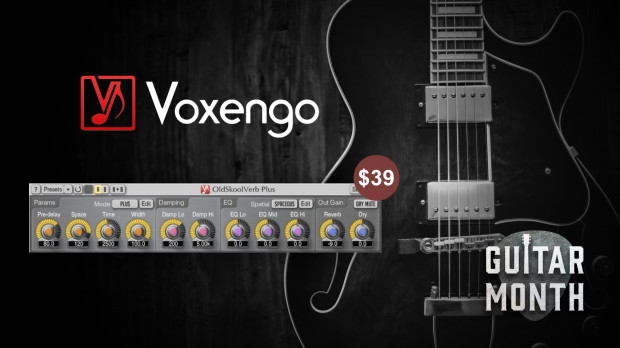 Get Voxengo OldSkoolVerb Plus Here for only $39 ! This plug-in implements a kind of “classic” stereo reverb algorithm which is technically simple yet optimal. It produces a very clear spatial image that always blends in well with the mix. This entry was posted in DontCrack, Plug-ins, Promotions and tagged hall reverb, OldSkoolVerb Plus, Plate Reverb, Reverb, Spatialization, Voxengo. Bookmark the permalink.